Last week Miss M decided that she wanted to give embroidered pillows to her teachers (she has two). She had a very specific idea in mind — if you’ve been reading this blog for any amount of time you’ll know that this is always the way it is with my girl — my job, as always, is to facilitate. She picked out her coordinating fabrics and threads, and wrote her teachers’ names in her very best cursive using a fabric pencil. 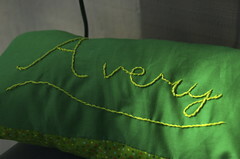 After all the kids were off to bed, I labored over the embroidery for the first pillow. It was extremely stressful as I hadn’t embroidered a thing since I was my girl’s age. It didn’t help that I was completely winging it. The glorious smile she beamed on me the next morning thoroughly made up for all my cursing and stressing the night before. These are really lovely – I’m sure the teachers will treasure them. I’ve used my sons’ handwriting on a cushion too, and i love the way it enables me to always have his little, innocent writing forever. They are lovely – and I love that it was all your daughter’s idea! embroidery or any handsewing takes a lot longer than it looks. i used to design + sew custom clothes + i’d try to do as much as possible on machines, but that handsewing is adorable.